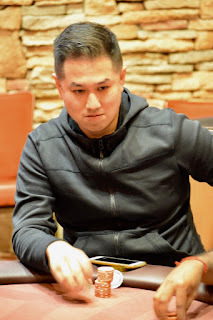 Sam Kuoch (above) is all in for his tournament life with Tens against the AQ of running-hot Ronald Quinones. The board goes 8-5-6-4 ... Queen on the river and Kuoch is out in 9th place, a $5,950 cash. Quinones was down to his last 3BB with 16 players remaining, and in with 5T against Mathieu Lum. He rivered Lum to stay alive, doubled through Marcos Stokes, knocked a player out to get to the FT and now has another knockout.